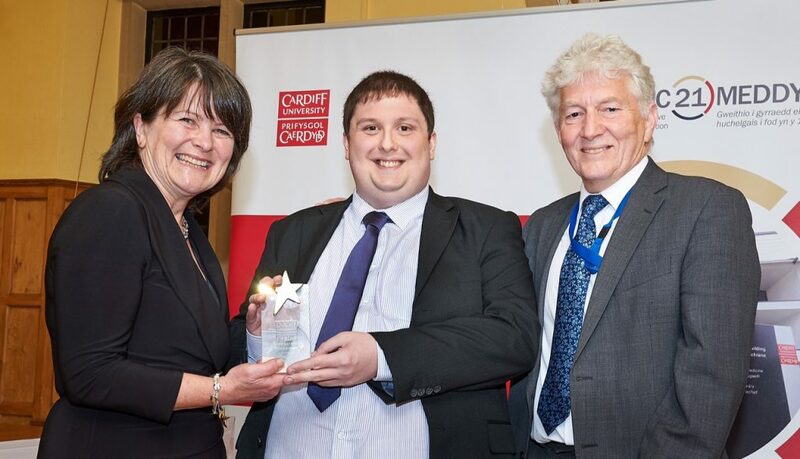 Jacob Meghan, an administrative assistant at the MRC Centre for Neuropsychiatric Genetics and Genomics, has been honoured with the Head of School Special Award at an annual ceremony in Cardiff. The STAR Awards were launched in 2016 to recognise the achievements and contribution of staff across Cardiff University’s School of Medicine. The winners were announced at an awards ceremony at Aberdare Hall. Jacob joined Cardiff University following a 10-week internship through Project SEARCH, an international initiative which provides employment and learning opportunities for young people with disabilities. As part of the Alzheimer’s disease field team, Jacob works with the laboratory technicians to barcode and store biological samples collected from research participants from across the country. Lily Beyer, Employment Training Coordinator at Elite Support Employment added: “It’s been fantastic to see how much Jacob’s confidence has grown since starting his original internship with Project SEARCH and I’m so pleased to see his contribution recognised and celebrated with this award. Project SEARCH is funded in Wales by the wider Engage to Change project, which works with employers to help young people with learning disabilities and/or autism to develop employment skills through work placements and support into paid employment. Learning Disability Wales was awarded £10m by the Big Lottery Fund – one of Wales’s largest Lottery grants – to lead a consortium of organisations, including Elite Support Employment, to deliver Engage to Change. Cardiff University is researching the success of Project SEARCH through its research team at the National Centre for Mental Health, as part of its evaluation of the whole Engage to Change project. Paul is the communications manager at NCMH and Senior Communications Officer at Cardiff University's MRC Centre.